This time last year I wrote a “Happy FanFest Day” post, and not wanting to simply repeat myself, I read it over last night to remember what I’d said. Last year, the Giants’ core players–Posey, Panik, Crawford, and others–came into Media Day (the Friday before the FanFest) with optimism, despite a near-historic 98-loss season in 2017. The team had added two face-of-the-franchise types in trades with Pittsburgh and Tampa Bay in Andrew McCutchen and Evan Longoria and had bolstered the roster with some small but strategic free-agent pickups. The players at Media Day and FanFest last year repeatedly expressed their appreciation for the front office’s efforts in trying to improve the team and their gratitude about playing for an organization that tries to win every year. There was anticipation and belief that they would shake off the anomaly of 2017 and return to competitive status. What a difference a year makes. Reading those comments a year later, knowing how 2018 turned out, is what made me sad. And now those same players are singing a different tune. By far the most interesting story at yesterday’s Media Day was Buster Posey. As in 2012, Buster is returning from a serious injury and surgery that derailed his season. (And unless something changes, as in 2012, it’s looking like the primary candidate to back him up is an unheralded rookie who has about five minutes of major league experience.) As in 2012, Buster is saying encouraging things about how great he feels and how he fully expects to be the Opening Day catcher. Last night was also the Annual Town Hall meeting, at which select season ticket holders get to see the Giants players, in groups, be interviewed talk-show style. Usually the event is hosted by Kruk and Kuip, but this year it was Jon Miller and Dave Flemming (he of the newly signed four-year extension). Giants’ PA announcer Renel interviewed Posey after his turn on stage, and it went something like this. Renel: You say you’ll be ready for Opening Day. Do you stand by that? Buster: I stand by that. That’s the plan and the goal. Renel: You said you feel so good that you’ll steal 20 bases this year. Do you stand by that? Buster: I do not stand by that. Posey made it crystal clear yesterday that, like most of us Giants fans, he is disappointed and confused that he walked into Media Day after a 73-89 season and saw pretty much exactly the same faces he saw last year. Here’s the key quote from his Media Day interview. “I sure hope that’s still the case.” Wow. That’s pretty damning and a pretty public way to voice his doubts and concerns. Besides those comments, it’s been noted that this week Posey (and Crawford) retweeted a comment about what a disgrace it is that Adam Jones doesn’t have a job yet (bearing in mind that Buster and Craw played with Jones on the 2017 WBC Champion Team USA). In his Town Hall interview, he “innocently” mentioned Jones again, as well as Carlos Gonzalez and Dallas Keuchel, all still free agents, as really good players. Later, between the Media Day and the Town Hall, Buster also tweeted this pointed comment. It would be unfair and untrue to call Posey “political,” but he is nearly always measured and careful, and well, corporate. For him to step outside his carefully constructed box to make these public statements suggests that he’s both frustrated with his own team and concerned about the bigger picture–the bewildering freeze on signing free agents that started last year and has escalated this year. 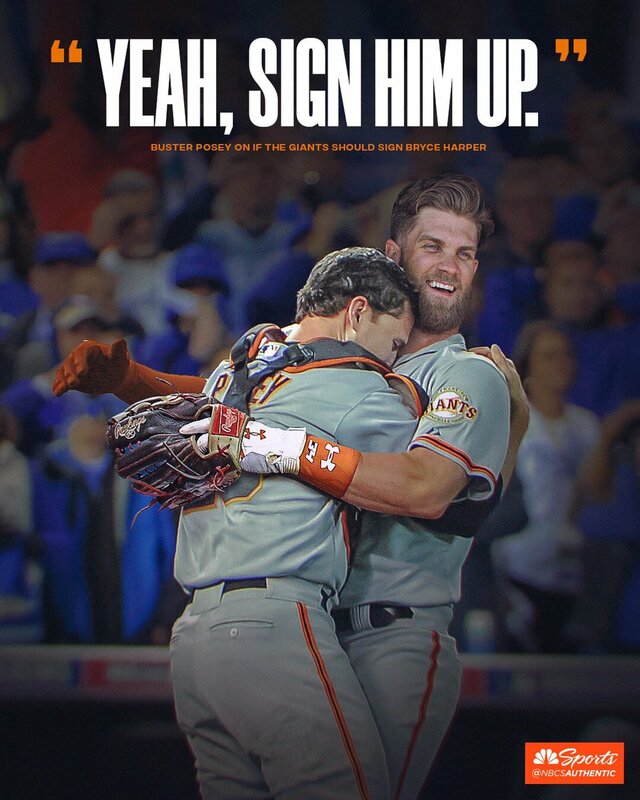 As for the Bryce Harper possibilities, Posey wasn’t coy. Sign him up, he says. Joe Panik, who played with Harper in the Arizona Fall League some years ago, also had a strong endorsement. It’s going to be great when Joe Schmoe from Sacramento (Ronny Cobb) gets to ride in the parade with Harper, after his sharp-eyed spot of Larry Baer in the Las Vegas Bellagio casino leaked the news of the meeting. I hope you all appreciate that as a dedicated blog reporter, I muted the TV for almost the entire second half of the Warriors-Phoenix game so that I could stream the Giants Town Hall event on my iPad. It was interesting and very different from previous years. So many young, unknown or barely known guys. Flemming actually had to introduce the whole last group, which included #ForeverGiants Breyvic Valera, Drew Ferguson, Travis Bergen, Pat Venditte, and Drew Pomeranz. Valera has apparently gotten the Zaidi memo because even though he barely speaks English, he helpfully piped up that he can play almost anywhere. When guys who were not even on the 40-man roster this time last year, like Alen Hanson, Dereck Rodriguez, Andrew Suarez, and Aramis Garcia, are the “familiar” ones, you know there’s been quite a sea change in the organization. Two of the more seasoned players in one group were Mark Melancon and Tony Watson. Flemming asked Melancon if he’d had anything to do with the Giants signing Watson, since they’d been longtime friends and teammates on the Pirates. MELANCON: No, I think that was the only offer he got. Sam Dyson talked a lot about Snuckles (his cat), and Dave Flemming must live under a rock or something because he didn’t know who Snuckles is. Flemming asked Chris Shaw and Tyler Beede, both from the Boston area, if they were Patriots fans, and helpfully noted that people call Pats fans “Massholes.” Then there was Reyes Moronta, a man of large girth and few words. Dave: Did you have a good offseason? 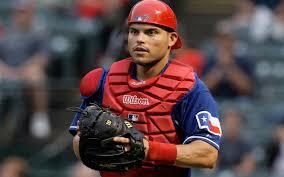 Last week I had an ode to Derek Law, who’d been DFA’d to make room for John Andreoli. Within a few days, Andreoli was also DFA’d, to add right-handed reliever Jake Barrett, whose stats are…remarkably like Law’s, except not quite as good. Well, I have good news for all of you. Remember this moment when one of those three turns out to be the Big Surprise of 2019. 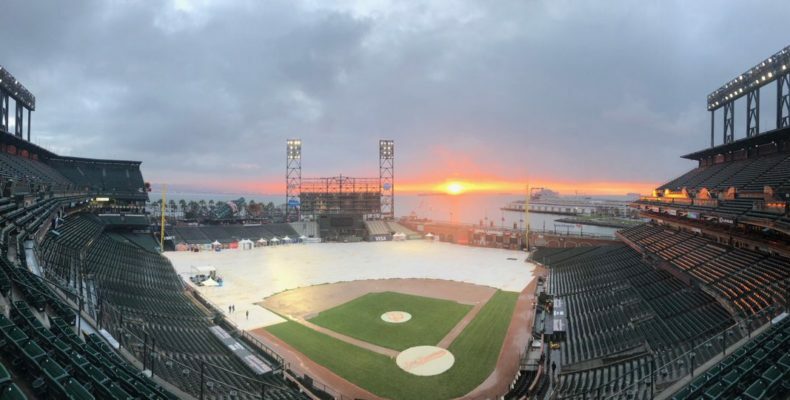 The FanFest starts a little over an hour from now (10 a.m.-3 p.m. PST), and from 9 a.m., Marty Lurie will kick it off for the first time this year on KNBR. If you’re not attending, you can listen to KNBR or you can even watch live video of the KNBR interviews. For the first time in #SFGFest history we'll be broadcasting a live video stream of the main stage on our website. For any of you attending, have fun and report back (and hope you brought a raincoat)! RIP to another Hall of Famer, former Giants manager Frank Robinson. And all the best to Hunter Pence, who signed a minor league deal with his hometown Texas Rangers. If you get The Athletic, be sure to read Grant Brisbee’s spot-on and lovely piece about this development. The Rangers play at Scottsdale Stadium on March 10, and we’ll be there! Hope we get to give Pence some love that day. Even though I share Buster’s bewilderment with the Giants’ lack of offseason activity, I still woke up with a bounce in my step. It’s FanFest Day, we can count down pitchers and catchers reporting in a matter of hours, not days or weeks, and baseball is almost back! Enjoy it all. Lefty out.